The patella bone is more commonly known as the kneecap. If you fractured this bone, then you more than likely have done it by falling on your knee. You may have a bruise on the area of impact of your knee. An X-ray can confirm this diagnosis. However, more serious fractures may require surgical intervention. 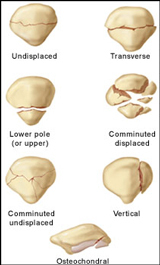 In these cases, your patella may be broken into two or more fragments. Many of the muscles that control your knee movement are connected to the patella. As a result, their function can be impaired if there is significant damage to your patella.